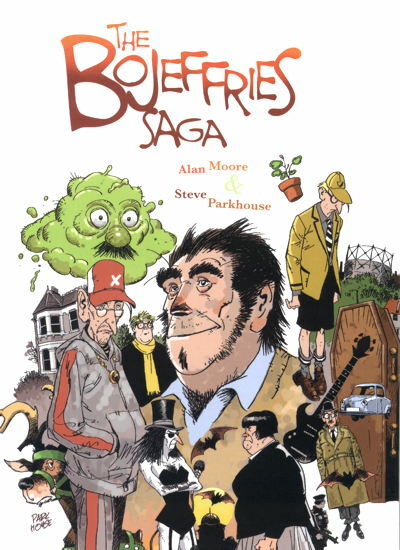 So this is Top Shelf’s new collection of all the Bojeffries stories by Alan Moore and Steve Parkhouse, including 24 new pages appearing here for the first time. The work is reproduced in its original black and white format, save for one short story printed in black and various shades of red. If you’ve never read these darkly-humored tales of this monstrously peculiar family, I would highly recommend picking up this book. …take note that the new Top Shelf volume doesn’t entirely supplant it. The Tundra edition of course doesn’t have the 24 extra pages in the newer collection, but this older book is in full color, which is nice but, as noted above, not how the stories originally appeared. However, there are a handful of pages created for the Tundra collection that do not appear in the Top Shelf book. Mostly they are one (and in one case, two) page gags (a dress-up doll of Ginda, a cut-out model of the garden, a Festus mask), but it is new Bojeffries material and it’s a shame none of it made it to the new volume. And then there’s that illustration of Ginda putting the moves on Lenny Henry, who provides the introduction. But the Top Shelf book does contain all the narrative material, so if you can stand the knowledge that a couple of gags didn’t make the transition, here you go. Plus, the original book is 22 years old and seems to sell for anywhere from $27 to $120 on Amazon, so you may want to do without it anyway. The odd cognitive dissonance of reading about John Constantine stuck in the middle of a big ol’ superhero crossover continues in this oddball tie-in to the “Forever Evil” storyline currently running in the Justice League books. In a strange way it sort of mirrors what was going on the last time Constantine was so closely tied to a Big Event Series, with John running around in Swamp Thing dealing with the more mystical side of Crisis on Infinite Earths . In that instance, the stories were definitely in the “this superhero stuff sure is weird” mode, with Alan Moore, Steve Bissette, John Totleben and the rest of the gang doing their off-kilter, somewhat creepy takes on the DC Universe. This time around, John and his magical pals are in full-on superhero mode, shooting eldritch energy beams from their hands instead of science-y energy, on a team that actually refers to itself, in-story, as “Justice League Dark,” a name that should have just remained a groaner of a comic book title. John is no longer really functioning as any kind of commentary on the DCU at large beyond his most basic “man, these guys” reactions. Despite that, Constantine and the other titles that are crossing over in their parallel “Forever Evil” event (like Pandora , Phantom Stranger , and the previously-cited Justice League Dark ) have been a lot of fun, possibly more so that the parent Justice League series, even if the storyline has been dragging on maybe just a bit too long. Not “Rotworld” long, but I’m probably ready for this to wrap up Any Day Now. If you like the current Hawkeye series, then you should pick up this new She-Hulk comic. It’s very much in the same vein, with strong dialogue and good humor and crystal-clear art. I just read it again for a second time, between typing that last sentence and this one, and I haven’t done that with a brand new comic on the same day I picked it up in long time. Every week I look over the new comics and invariably marvel at the fact that FOREVER EVIL is still ongoing – feels like that story has been happening since the Truman administration. I’ve been trying to decide if the fact that they didn’t go for the more obvious “Shadow League” as an in-story name for the group (while keeping “Justice League Dark” for branding purposes) was because they didn’t want to confuse it with the League of Shadows, because they really think using the name “Justice League Dark” in the stories builds brand recognition, or because they refuse to read the dialogue the characters say out loud to realize that even kids would cringe at it (and these books aren’t for kids anymore, so arguably that isn’t the standard you should be using). 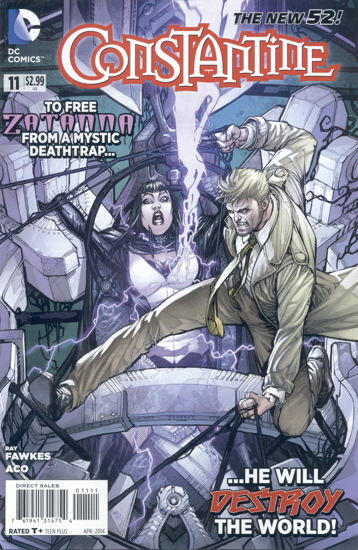 Because if you say “Justice League Dark” out loud it sounds like part of a line of “Justice League” candybars. “Justice League”, “Justice League Dark”, “Justice League with Nuts”, “Justice League Peanut Butter”, etc. “Dark Justice League” would, at least, be non-candybar speak. But it’s not only a mouthful, it’s kind of nonsensical. “The shadow Justice League” is at least something people would say that could conceivably also be a team name. I understand the desire to have JLA, JLB, JLC, JLD, etc. as the branding strategy (which I suspect is why they were half thinking for a while of “Justice League Canada”) but really – going to far in the name of branding should be a misdemeanor. pft. They may as well call themselves JUSTICE LEAGUE DOUCHE. Too close to Dark Avengers, in that it would invite ridicule? Then again, they’re both stupid names. 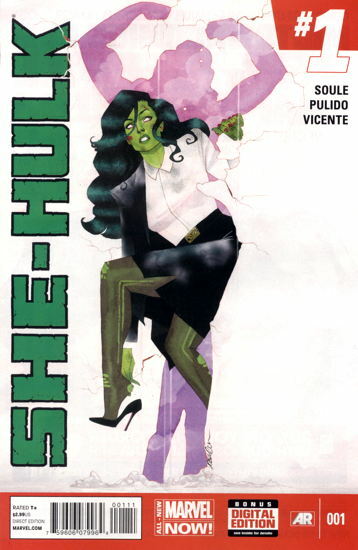 Any She-Hulk after Slott’s She-Hulk is superlative. Thena gain, people probably said that about Byrne’s She-Hulk. I may just be old and cranky.